This masterclass will be our final masterclass of the year, and the dress rehearsal for the May 19 Annual Spring Recital. As always, performance selections and order will be posted on the studio website about a week ahead. As many of you know, I like to recognize each student at the Annual Spring Recital for his/her achievements in music, but also in other fields. Past non-music recognition: debate team, swim team, student mentoring, etc. Please send me a list of your achievements, musical or otherwise, ASAP, but no later than Sunday, May 13th. Do not assume that I know or remember your musical achievements! It's better to err on the side of too much information to make sure it's all there! As hard it is to believe, we are nearing the end of the studio performance year! For the first time in 26 years, the Annual Spring Recital will NOT be at Truro Church. 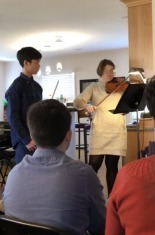 Instead, Mr. Joseph Yoo has kindly invited us to use the performance space at Fairfax Fine Violins. This recital is a celebration of the musical year, and a chance to give back to our family and friends who have supported us through transportation, purchase of fine instruments, attendance at festivals, recitals, and competitions, and encouragement in good times, as well as tough times. Students are encouraged to invite as many people as they like. This is a time to share your talents! Invitations will be sent via email to all students. It is a pleasure to announce that EIGHT Gold Cups will be awarded, recognizing years of performance in VFMC Spring Festivals! In addition to the Gold Cups, the Studio Stellar Student and Performance Attendance trophies will be awarded. Students: please arrive no later that 2:40 to acclimate your instruments, tune, and warm up. Due to the direct conflict with the District 12 Festival, Mrs. Doris MacDonald will be Maddie’s pianist for this performance. David, John, and Jason performed in the first round of the Fairfax Symphony Feuer Competition. Although none advanced the final round, it was an honor to be selected to perform, and all felt they had strong performances. The entire Fall Studio performed at the 2019 Springfield Music Club Annual Spring Festival on March 8th. The twelve students in the studio performed a total of 34 musical selections in 22 events, representing four categories (Violin Solo, Violin Concerto, Viola Solo, and Viola Concerto)! The judges’ comments were super helpful, and scored the students with 20 Superior Ratings and 2 Excellent Ratings. Mrs. Fall is extremely pleased that EIGHT Gold Cups will be awarded at the Studio Spring Recital on May 19th! !